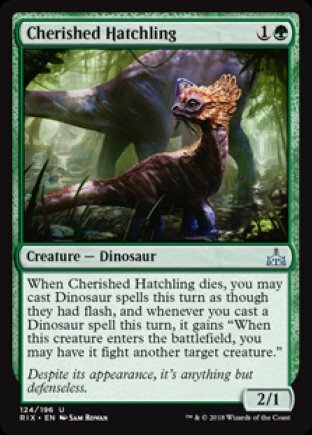 * Dit is het aanbod van Cherished Hatchling uit Rivals of Ixalan. Als een kaart in meerdere series zit kun je die apart aanklikken hierboven. Klik op de getallen om direct naar iemands collectie te gaan. De leden die het meest recent zijn ingelogd staan bovenaan. Leden die meer dan 14 dagen niet zijn ingelogd worden niet vermeld. During the turn Cherished Hatchling dies, you may cast any number of Dinosaurs as though they had flash. You must pay the costs for spells you cast this way. If there’s an alternative cost you can pay instead of the mana cost for a Dinosaur spell, you may pay that cost instead. For the triggered ability that the entering Dinosaur gains, if the target is illegal when it tries to resolve or if the Dinosaur that entered the battlefield has left the battlefield, no creature will deal or be dealt damage. For the triggered ability that the entering Dinosaur gains, you choose a target when the ability goes on the stack, but you don’t choose until that ability resolves whether those creatures fight. If an effect refers to a “[subtype] spell” or “[subtype] card,” it refers only to a spell or card that has that subtype. For example, March of the Drowned is a card that benefits Pirates and features Pirates in its illustration, but it isn’t a Pirate card. We hebben alle decks op de site voor je doorzocht en gekeken welke 20 kaarten het meest met Cherished Hatchling samen worden gespeeld.